I have a weird fascination with recycling tshirts and other discarded clothing. I think it has to do with the fact that I just happen to have a huge collection of cool shirts with prints of interesting things on them and it's hard for me to let go when they're too worn out or don't fit anymore. I just want them to be useful again! And so, I love it when I come across projects like this that make it easy for me to re purpose one of these cool shirts in an actually relevant way. 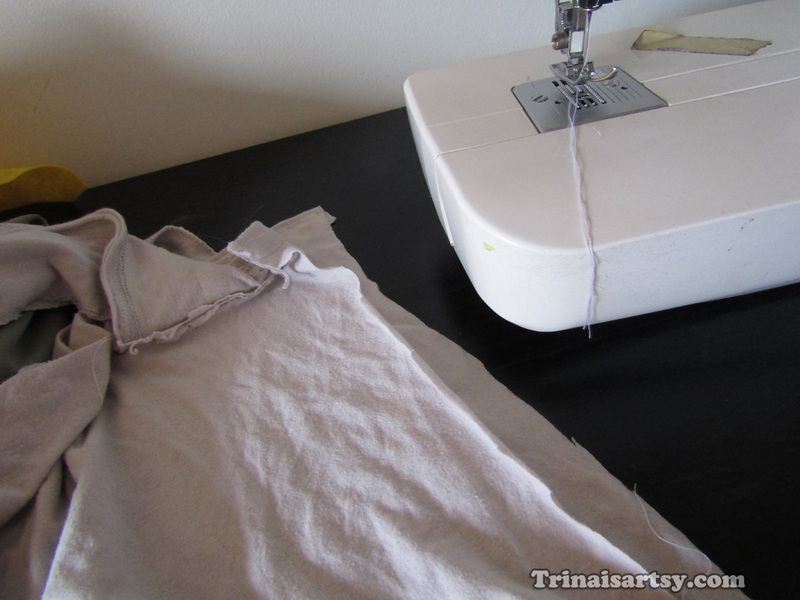 Whatever your reasoning behind wanting to recycle your old threads, here's how you can make your own t-shirt bags easily at home. Before we begin. Firstly, your life will be a lot easier if you can get your hands on a sewing machine and actually know how to use it. For this tutorial, I'm going to be using one for the sake of time and sanity. If you are a glutton for punishment, you're more than welcome to hand sew it, but I can't guarantee it will be as sturdy as if you had done it with a machine. 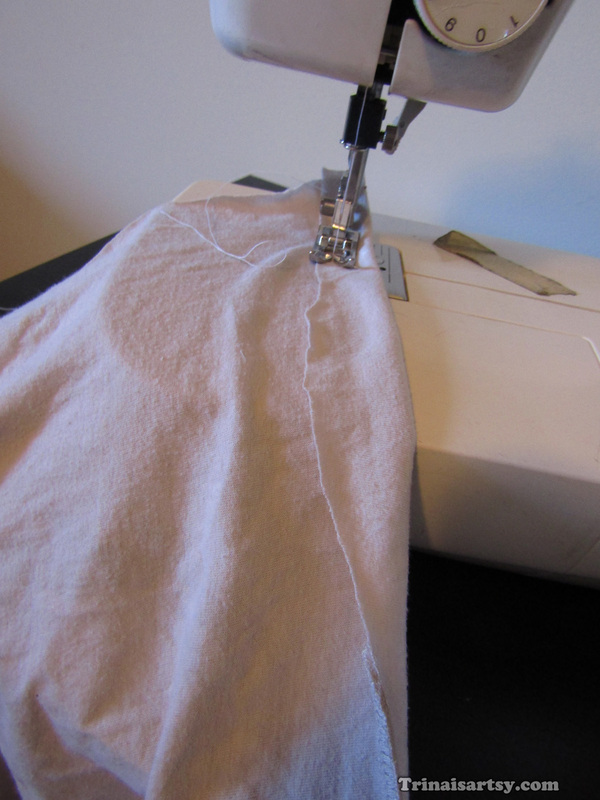 On the bright side, this is a great beginner's project for a sewing machine. If you have the chance and haven't yet, why not give it a try? Step 1. Get some cool tshirts. Or not. Maybe use that ugly long sleeved black turtleneck that kept riding up every time you tried to sit down somewhere. Get revenge by having to cut it up! But that's just an example. Even though t-shirts are the easiest to use for this project, there are other options. Any kind of old clothing would work. I think the ultimate goal would be to try to find something to re-purpose.... saving the environment that way, y'know? Step 2. 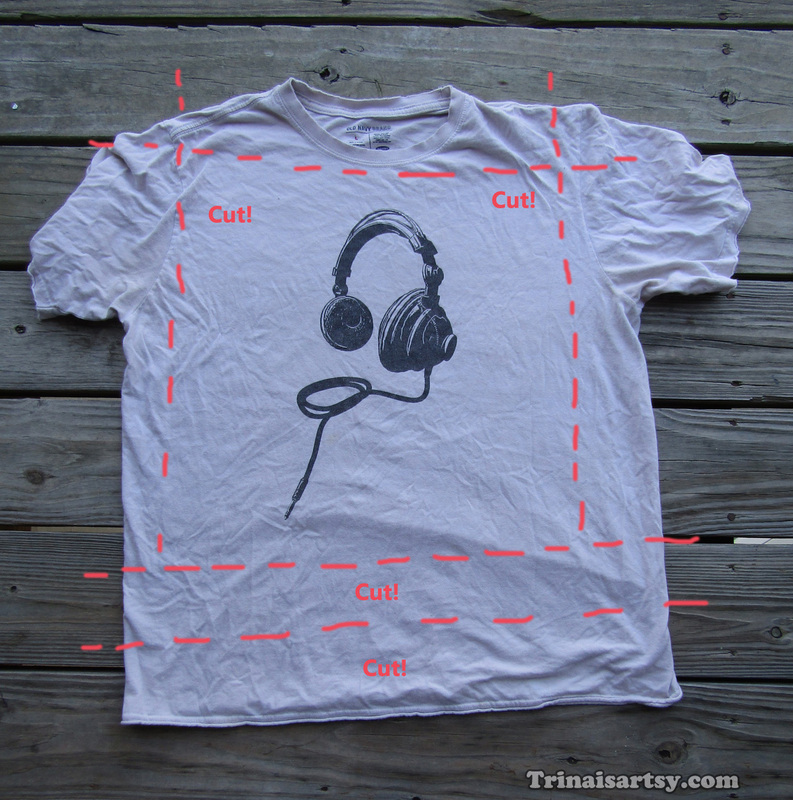 The next step would be to lay out the shirt for cutting. I have been known to free hand this step, but a wise person would find a pencil or something to mark where they want to cut before they go crazy with the scissors. Step 3. Cut it up! Begin by cutting the bottom off of your t-shirt to make the straps. Start by cutting a big strip and then fold it in half and cut it again to make it into two fairly even strips (There will be four strips total if you count the back and the front.) 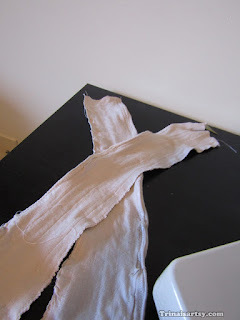 Then, cut the sleeves and collar off evenly so that you have a nice, straight, rectangular shapes to work with. Now you have all the pieces cut that you'll need to complete your bag. Step 4. Time to get sewing. Working with the printed side facing down, fold over a strip of the top of the bag and carefully sew a double folded hem. Repeat this step for both the back and front pieces of your bag. Only sew a hem at the top, don't worry about the sides or bottom. The hemming will give your bag structure and keep it from stretching out infinitely when you start using it to put stuff in. By the way- I am by no means a super expert at sewing, so if you need a little bit more clarity on this subject, here's an excellent tutorial that explains double folded hems. I personally don't measure the hems or use pins for this project, but they may be helpful to some. Step 5. Now, we will sew together the strap pieces. Double up the straps so that there are two pieces stacked for each strap. 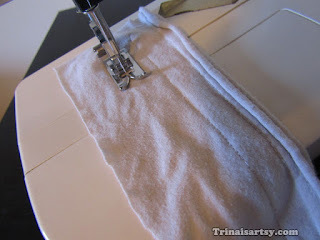 Just sew a few lines right down the middle of the strips/loops to reinforce them. Step 6. 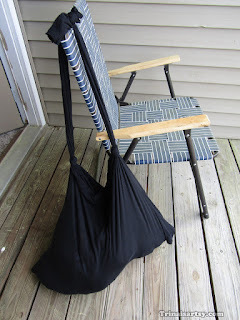 Take your newly reinforced straps and sew one on each side of the bag. Orient the strip so that the end of it is right below the double hem of the bag. Very important- Make sure the long part of the strip is facing UPWARDS! Otherwise you will end up with a very twisted and confused strap. 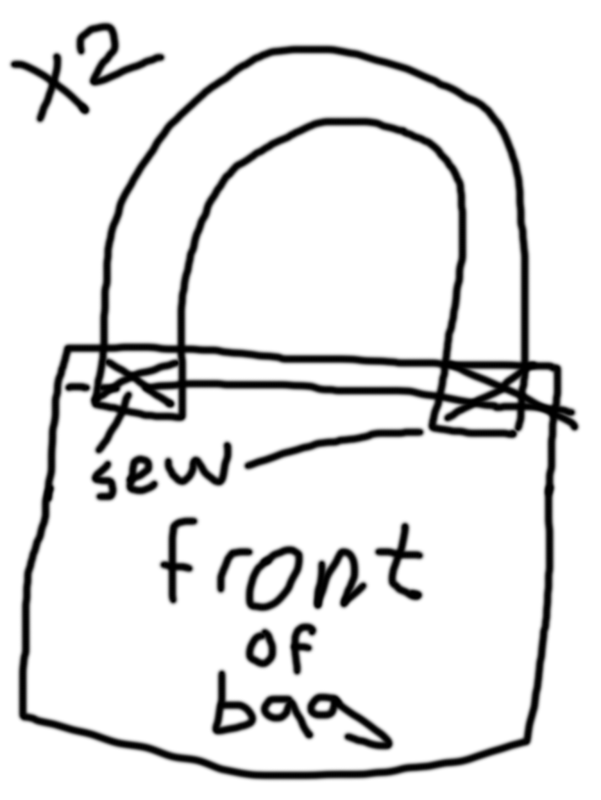 To make this step more clear (because I didn't take any good pictures of it) here's a diagram to further explain the orientation of the straps and the bag piece. Tip- Sew a square over the strap ends and finish it off with an X to make a sturdy bond between the strap and the bag front. Step 7. Now it's time for the final construction step! 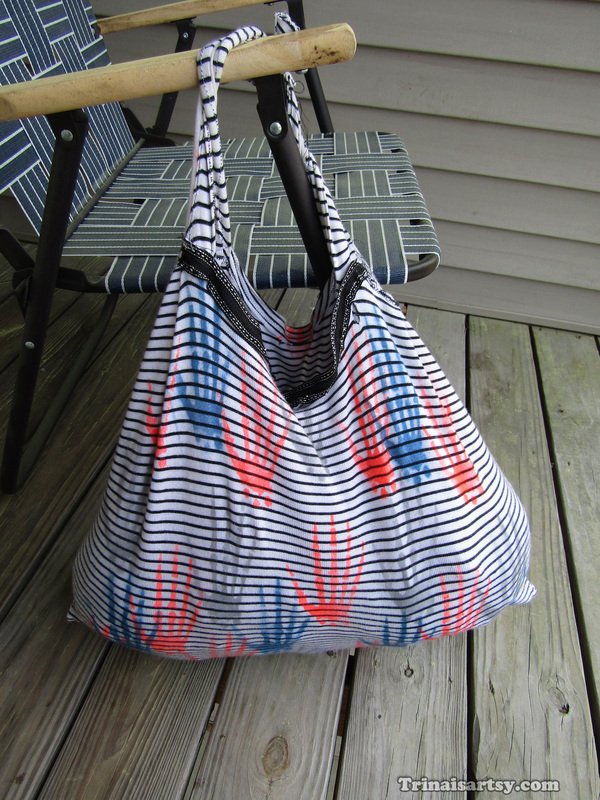 Put the back and front of the bag back together, print sides facing inward, and sew up the sides. Be very thoughtful about your seam allowances and don't sew too closely to the edge. I usually make two three separate passes with the thread, to ensure it won't be busting a seam any time soon. Step 8. Turn the bag right side in and take a step back. Admire the bag. See how many things you can fit in the bag. Pet the bag. Marry the bag. OK, maybe just date the bag because you aren't ready for that kind of commitment yet. Seriously though. These things take a very impressive beating! And it was so easy to make, too. Also, check this out... I originally sewed the strap to the completely wrong side of the bag altogether. HOW DOES SOMETHING LIKE THIS EVEN HAPPEN!?! I had to cut it off and start over, haha. I guess my point is, don't be discouraged if your bag turns out not being exactly "perfect." 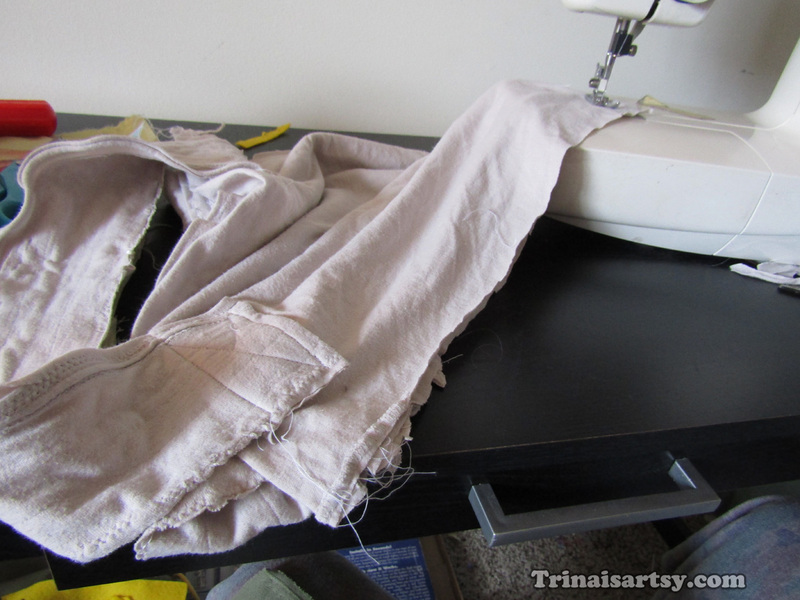 Sewing projects can be tricky sometimes, but are often very much worth it! Still a little wary about construction? Try to make an easier version of this t-shirt bag. It doesn't involve as much complicated sewing. 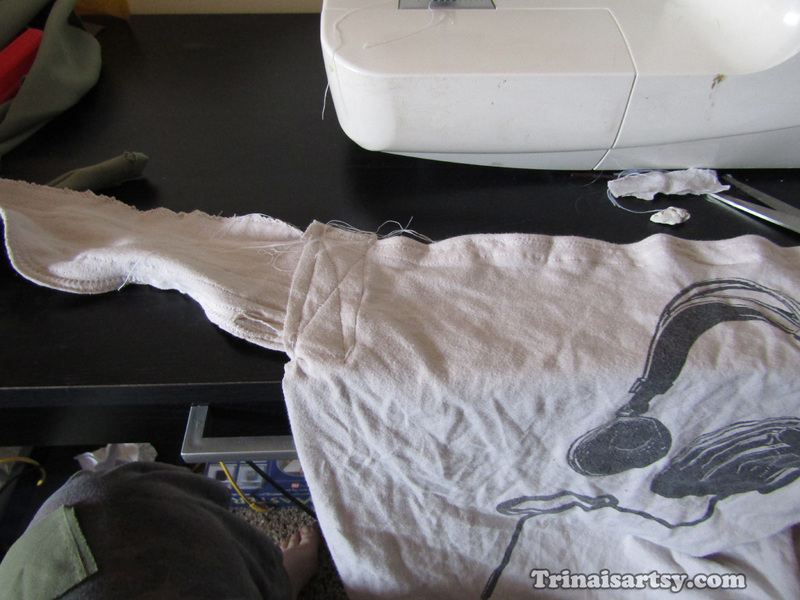 All you need to do is cut off the collar and the sleeves, kind of in the shape of a U. This will give the bag shape. From here, just sew up the bottom of your t-shirt and you'd have something that would function like a bag. And that's it. However, this quick and dirty job won't last for very long, and you will end up with a bag that eventually starts tearing apart or stretching out too wide. Still, if you have a lot of t-shirts that you'd like to utilize or you don't want to go through all the trouble of cutting and sewing the pieces for your bag, this is another way to go! Try painting a design or a pattern on the t-shirt before cutting it up to make it even more one of a kind. For example, I spray painted a stencil of some skeleton hands on this stripey bag I made out of an old tank top. I also added a little ribbon trim to the top for a hem instead of folding over the shirt itself. Do you have a t-shirt that has long stretchy sleeves that keep getting tangled in your washing machine? Time to get that revenge. 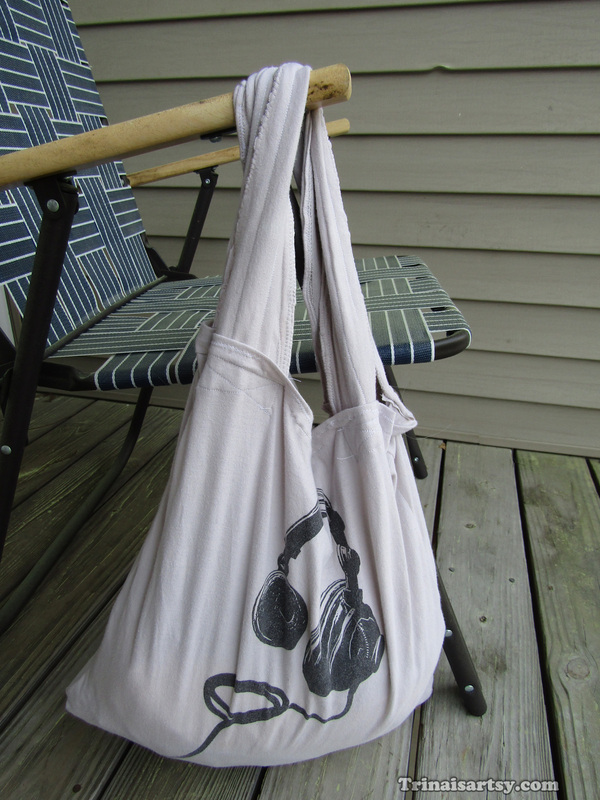 Utilize those pesky sleeves by making the shirt into a messenger bag. The sleeves can become just one big strap! I didn't end up having to sew the sleeves at all, I just tied them together in a few knots and done. A few words of caution. Pointy things are these bags' worst enemy. You're more likely to stab a hole in the thing than bust a seam. Be careful with scissors and sticks, I've blown out a few bags because of these items. Weight can also be an issue, but not as much as you'd think. While the bags don't have issue with holding tons of objects inside, carrying them around by their handles when the bag is over loaded can sometimes result in tearing of the fabric itself. I also like to hang these things in closets with hangers and sometimes the bags are so heavy the hangers warp so much that they fall down! 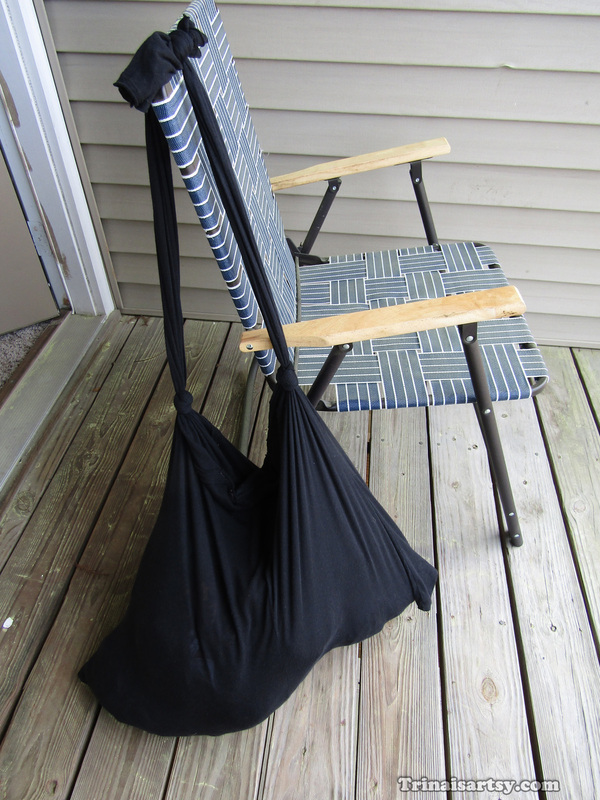 There are so many different uses for t-shirt bags. A lot of people use them to save money on grocery bags. I personally use them mostly for storage purposes - all of my pajamas, underwear, socks, and other odds and ends get tossed into these bags and it saves me time and space. 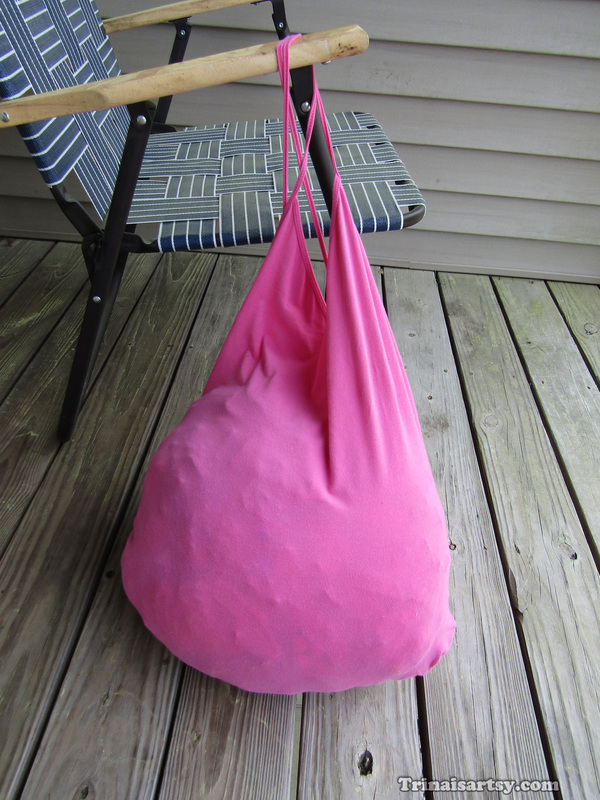 They're great if you have a huge haul of stuff to carry and you need a bag ridiculously big enough to hold it all. The expanding capacity of these bags is actually really amazing. 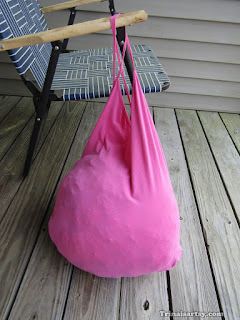 I'll conclude this tutorial with an invitation to show off your own recycled bags or any other project that utilized second hand materials in a practical way. How did they turn out? What do you use them for now? 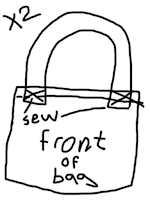 Also, If you have any questions about this tutorial or any more ideas on the subject of how to make your own bags, please do leave me a comment below!